Are you familiar with Reiki? What about chakras? Perhaps you're a bit hesitant about whether they are real methods of healing or just a placebo effect that the mind creates. This experience may shed some light on the effectiveness of energy healing. The past month I attended a spiritual fair where many energy healers, massage therapists, medical intuitives and psychics gathered to offer their services at the Learning Light Foundation in Anaheim California. At the time, I thought it would be fun to check out. Little did I know the powerful energetic changes that were about to take place within me. I arrived at the location to find a small recreation church-like building in the immigrant side of town. As I walk to the door, a kind old man greets me and asks for the $2 admission fee. I give him the money and, with his shaking hands and warm smile, he places in a steel collection box. I walk through a narrow hallway and into a big room with about 25 psychics, healers, and therapists each about 3 feet away from each other with a small table and an empty chair in front of them or a client. Alongside the walls of the room are vendors selling crystals, books, stones, and herbal healing products. "Yogi Yagnesh ShantiOm: Accomplished musician, poet, craftsman, yogi and a healer. He has helped many people by teaching Yoga, spiritual consoling, and by his healing hands. He combines Pranic Healing, with Tibetan Reiki and Special healing prayers & Mantras. 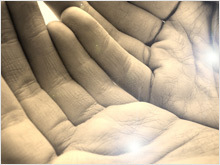 He has over 15 years experience as a spiritual healer." The cost is $45 for a 30 minute healing session. I walk over to the lady receptionist and tell her I would like a session with this healer. Just as I am paying her, the healer walks over to her and says "So, anyone come in for me?" She replies, "You're just in time, he wants a session with you." We both chuckle and he says jokingly "See, I'm psychic." We walk upstairs to a large room with a massage table. He asks me to take off my shoes and lay with my back on the table and my eyes closed. He proceeds to check my chakras with a crystal pendulum and jokes that "its a good thing I came in" (I had been doing a lot of partying around this time which probably messed up my chakras). As I lay with my eyes closed, I could feel him waving his hands and arms a few feet away from my body, as if he was fluffing my aura. My ego kept blurting out thoughts like "This is total crap, he isn't doing anything, this is stupid." I kept quieting my mind and saying to myself, "I am open to this healing and allow it to take place." Within a few minutes of that, he moves his hands towards my neck and I feel a powerful heat coming towards me as he lay his hands on the back of my head in a triangular position, as if propping it up with his hands. He continues to place his hands there for a few minutes. He proceeded to lay his hands in a different place and position for each chakra. He then asks me to turn around so I am laying on my stomach. He proceeds to lay his hands the same way on the back of each chakra. Each time it just felt like he was laying his warm hands on me and nothing special was happening. It was kind of weird but I kept an open mind. Then suddenly, as he was working on the back on the Solar Plexus and later, on Sacral chakra, I felt a sharp pain travel a few inches up into my heart and within 3 or 4 seconds dissipate into nothingness. These two twinges of pain were the only things I felt the entire 30 minutes. He finished up with another aura fluff and then I was done. He tells me, "Don't take a shower until tomorrow, that way you keep the energy in you. Also, you may feel some changes. Like sudden crying, happiness, or a feeling of letting go." That day I felt good and although I didn't take a shower, I did go out to a club and had about 5 or 6 beers. The next day I felt a bit hungover but had a little more awareness. The real change came two days later, Monday. I woke up excited to be alive and to start working. I felt happier and calmer for no particular reason. I also felt like I had just had a big workout 2 days prior: my muscles were sore, like I was recuperating but rebuilding strength. I had almost forgot that I went to a healer, until I started to connect the dots. A month later, I went to see him again for another healing session. He tells me "You will be more receptive to the energy this time." I lay down and go through the whole routine, except this time it feels different. Each time he lays his hands on me, instead of feeling nothing but a little warmness, it feels like his hands are charged with warm energy and are sending a stream of tingling sensations into my body. I enjoy the feeling and relax. This time, the mental chatter of skepticism does not come up at all. I thank him and go home. That night I did not shower but again drank a few beers and partied. The next day, however, was anything BUT normal. The entire day I felt like I was lighter, almost like I was floating just a little. I wrote in my journal about some realizations about myself and life. I accepted myself on a whole new level and came to terms with my own imperfections (which led to this post). I poured my heart out as I wrote and felt a tremendous letting go. Afterward, my entire chest and most of my body felt a powerful, almost electric charge, like a pervasive tingling. It was like my heart was radiating energy and morphing or healing itself on new levels. It was indescribable, like nothing I have ever felt before. I literally felt like I had someone else's heart in my body. The changes became more apparent as I continued with my daily life. Things that worried me or bothered me seemed trivial. I enjoyed just being with my friends, just spending time with them eating or talking. When I went out to clubs I playfully flirted with girls with no consideration for what could go wrong. My female friends that I haven't called in a while started calling me non-stop to go out and party. I started making more jokes about everything with everyone, I was funny again. I enjoyed every part of life that I had somehow forgot before. My eyes and heart became open to all the love around me that I had been resisting all along. I realized that living in the heart means enjoying life, not analyzing it. In the past, as soon I would start to analyze a situation and try to "figure out" another person, I was operating out of the ego. When I just let go of the need to analyze and interpret, I allow myself to enjoy everyone and everything without judgment. That is living from the heart. I did chakra meditations to keep the feeling for as long as possible. It slowly drifted away to some extent, but my heart remained at a level of consciousness much higher than before. I had been working on my own chakras for a long time, which I believe allowed me to get so much benefit from the healings in such short time. My goal now is to develop a lifestyle that supports this heart consciousness; and utilizing regular energy work with myself and healers is now a part of that. I have already subscribed…and I’ll be back regularly…. Did you ever find out any details about what caused the pain during the first session? Hey Bart. I asked the healer about it and he only told me, “you are sensitive to the energy.” I assume it was simply energy blocks being released. Appreciate the feedback Tania, I didn’t know Reiki masters read my blog 🙂 that is cool to hear. Thanks for sharing the experience. I have been tempted to go for a session as well and my wife is encouraging me to go. I’m still a little hesitant but your post is making me think more about it. Your reactions sound very similar to a response I had after sitting in a hot spring in the middle of January in Colorado. I was light, energetic and very happy for a couple of days afterward. It was a great experience. Hey Bruce, yeah energy healing has been a tremendous boost to my personal development. In fact, its probably one of the best ways I found to clear out old emotional blocks and baggage and welcome in more good healing energy. I’ve never tried Reiki healing. Now that I’ve read your post, I think I’ll give it a try! Thanks for sharing your experience with us. Yeah finding a good energy healer is something I recommend for everyone as a must have if one is serious about healing themselves and growing spiritually. Its very powerful, the key is in finding one that has a resonance with your energy field so you get the best results. this was a very impressive story ! This gave me goose bumps ! Reiki is a powerful force and it works on my patients 🙂 Thank you for the post. « Is the Need for Perfection Holding You Back?